In the years following beginning of the the Great Recession, much of rural America dealt with population loss. There is evidence however that this trend has started to reverse itself. For the second straight year, rural America has recorded population growth, largely driven by net positive in-migration. The growth is small, just 37,000, but it represents the reversal of the negative trajectory that dominated the early-mid 2010s. There is, however, a caveat to this finding. The counties that grew the most were either adjacent to metropolitan areas or home to recreational opportunities that would attract migrants, especially retirees. The most isolated rural pockets still recorded losses. As this map from The Daily Yonder illustrates, these population losses hit the most impoverished and disadvantaged areas of the country the hardest. For example, Appalachia and the Black Belt South are both home to counties that are continuing to depopulate. This map also tells a compelling story. You can look at it and see the depopulation of areas that have historically relied on industries that have since declined. In New England, Northern and Downeast Maine continue to experience population loss. In fact, Hancock County, home to Acadia National Park, is the only county in the Downeast region to gain in population, an illustration of the principle that recreational activities are a driver of population gain. Maine is one of only three states (along with Vermont and West Virginia) with a majority rural population so its rural communities are vital to the overall health of the state. The areas that have been hardest hit in Maine are those that have historically been reliant on fishing and logging. As these industries have declined, as have the fortunes of the towns that once supported them. The same is also true in West Virginia, which has historically been supported by the coal industry. In fact, the majority of counties in West Virginia lost population, an affliction that also affects neighboring and also formerly coal reliant eastern Kentucky. The map also tells another compelling story, the decline of the impoverished rural South and the region's continued struggles. I would be remiss if I did not mention that my native county, Robeson County, North Carolina, saw a decline of 759 people in the last year. Within this however is also a great illustration of the growth of metro adjacent areas. Just last month, the Robeson County Board of Education discussed shutting down my high school alma mater, South Robeson High School, because of the declining youth population in that section of the county. In making that decision, they noted the asymmetrical growth in the county, with the northern part of the county, which is metro adjacent with Fayetteville being just over the county line, experiencing growth and the more isolated southern part experiencing population loss. Despite the growth in the northern part of the county, Robeson has, for the past couple of years, been leading the way in population loss in North Carolina. Robeson County's population losses also fit into the broader trend of impoverished, rural Southern counties declining in population. In almost every Southern state, the impoverished counties are the ones that are losing population. This story illustrates a growing problem, the continued isolation of disadvantaged rural communities. While this study is an overall positive for rural America, it does contain some continuing and troubling trends. As the most impoverished and disadvantaged communities continue to experience population loss, it will disproportionately affect the most vulnerable in those communities. Many of the most vulnerable people in these communities lack the resources to simply move to a new area to look for work and will be directly impacted by the consequences of a smaller population. For example, if property tax revenue declines, who will pay for schools? If skilled people are not moving to the area and are leaving, who will provide medical services? Legal services? As I have discussed in this space many times, there is an almost universal rural lawyer shortage and in many spaces, the bar is only aging. The potential impact of the continued decline of disadvantaged rural spaces could be dire for the most vulnerable in those spaces. While the shortage of legal services in rural communities is generally known, there is limited data on the extent and nature of the problem. This report aims to quantify the shortage of legal services in New York's rural counties. The data contained in the report will inform the work of policy makers, advocates, and bar associations. Additionally, attorneys can use it to determine market trends to build or expand their practices. The report is organized around three key issues identified in the survey: what rural practices are like; the nature of access-to-justice gaps in rural communities; and how rural practice and systemic burdens impact efficient delivery of legal services in rural New York counties. Many rural attorneys are overwhelmed by volume of cases, financial stress, and limited resources, among many other rural practice burdens. Rural practitioners have trouble finding qualified attorneys to refer cases to. Over half the attorneys surveyed are at retirement age or are soon approaching it. Several high-needs practice areas have a shortage of experts. Rural practice involves unique challenges, including due-process issues related to non-attorney judges, inefficiencies in town justice courts, a lack of access to broadband, and a prevalence of indigent clients. As the access-to-justice gap continues to grow in rural communities, the [Albany Law School] Government Law Center has produced this report to highlight this issue and inspire creative multi-stakeholder solutions. Additionally, this report implicitly spotlights the admirable public service of current rural attorneys who support their communities and clients under tremendous challenges. I was delighted when two "rural" newspapers/journalists (by some definition) won Pulitzer prizes in 2017. Art Cullen of the Storm Lake Times (Iowa) won for editorial writing, and Eric Eyre of the Charleston Gazette-Mail won one for his investigative reporting on the opioid epidemic in West Virginia. Now, Tony Messenger of the St. Louis Post-Dispatch has been awarded the Pulitzer for commentary for his reporting on Missouri's debtors' prisons (or, to be more precise, county jails functioning as debtors' prisons). Here and here are the Post-Dispatch's stories about Messenger's win; the first link compiles the Tweets about each of the columns in the series. Messenger found defendants across the state who had fulfilled their sentences and served out their paroles only to be saddled with thousands of dollars in “board bills” for the time they spent in jail. It’s a story about how we treat people in our state. It’s a story I’m going to keep telling. Messenger started writing about court costs and other criminal justice issues, often in small-town Missouri, in 2017. He has written more than 25 columns on the subject. His Pulitzer entry submitted 10, printed between Jan. 5 and Dec. 9, 2018. One of those stories is from November, 2018, dateline Breckenridge, population 383, and it tells the tale of a man in his late 20s, married and with four children, who is still paying $50/month on a "board bill" for two nights he spent in jail for stealing a lawnmower when he was in high school. What was initially an $80 bill eventually ballooned to more than $3,000. This is the reality for a lot of poor Missourians in rural parts of the state who end up on the wrong side of the law. Long after they’ve served their time and paid their fines, they end up tethered to the court system by private probation companies that have built-in financial incentives to find probation violations, and judges who are all too willing to serve as debt collectors. Pay the bill, or debtors prison awaits. It is a problem that threatens the independence of the judiciary, says Lisa Foster, a former judge and Department of Justice official who is a co-director of the Fines and Fees Justice Center. But what her co-director Joanna Weiss calls the “poverty penalty” is alive and well in many rural Missouri counties. It is a rare and beautiful thing when solid reporting so shocks the legal system that change becomes inevitable. Tony Messenger is making that kind of impact. Recall that heavy fines and fees were part of the story of Ferguson, Missouri, a story that unfolded only after the police shot and killed Michael Brown. Read some NPR reporting on the subject here. Ferguson is metropolitan, a suburb of St. Louis. Here's the report from the Sierra Sun Times. The case is out of Lassen County, California, population 34,895, and in particular the tiny community of Standish. The 68-year-old defendant did the poaching on his 80-acre property. [He] pled guilty to crimes associated with poaching in excess of 150 raptors and other wildlife on his rural Lassen County property. He was sentenced to 90 days in jail and given a $75,000 fine and five years of probation. Probation terms include full search authority, prohibitions on possessing firearms, hunting and fishing, and a requirement to obey all laws. The two firearms used during the commission of the crimes were ordered destroyed by the court. Among the other dead wildlife found on the defendant's property were two bobcats and a mountain lion. The remains were necropsied by the U.S. Fish and Wildlife Service Forensics Laboratory in Ashland, Oregon. The California Department of Fish and Wildlife prosecuted the case, with assistance from the California Department of Justice. President Trump recently declared the nation "full" in relation to his attempt to stop immigration. The New York Times took the opportunity of that declaration to explore and explain the parts of the country that are empty and, in fact, getting more empty. That is, the Upshot brought us an interactive map showing which counties are losing population and how dramatic the loss is, particularly with regard to the prime working-age population (ages 25-54). Nearly half of Americans live in a county where the demographic slice has shrunk in the last decade. Here's an excerpt from the story that calls out "rural." Then City Lab yesterday published this by Richard Florida under the headline, "How Heartland Visas Could Reduce Geographic Inequality." Here's an excerpt of the part(s) that is most closely related to the "emptiness" of rural America--also known as spatial inequality. Historically, the U.S. has seen economic and demographic convergence as people moved to areas of greater opportunity. But as a growing body of research documents, such convergence has slowed in recent years; instead, the economic fortunes of the coasts and the heartland have been diverging. Heartland visas are not a panacea for all the myriad problems of struggling places. Many of these places lack research universities or global connectivity or other factors that are required for growth. And many of them have failed to develop the strategy to harness their assets and address the challenges they face. That said, creating incentives that would redirect high-skilled immigrants from established tech centers to less dynamic regions of the country could help spur growth in lagging places while taking some of the pressure off the already unaffordable housing markets of leading hubs. From the culture department: "Old Town Road" and what gets to be "country music"
Read Jon Caramanica's feature for the "rest of the story." Another controversy over the relationship between race and country music, this one from spring of 2013, is here. I'm also reminded of some of the commentary around Kacey Musgrave from a few years ago (alluded to in the Caramanica piece), as well as in the immediate run up to and in the wake of her win for Album of the Year at the 2019 Grammy Awards. Apparently Kacey has not always been widely accepted as a country musician. I wonder how much that has changed at all since her big Grammy wins this year. And while we're on the subject of Kacey Musgrave, don't miss this story about how women over the age of 40 are disadvantaged in the world of country music. (Indeed, I'd argue that they are disadvantaged everywhere ...) Good thing for Musgrave that she's only 30. N.B. Caramanica's story is the cover story of the Arts and Entertainment Section of the April 21, 2019 New York Times, accompanied by this related story and a feature about/interview with Shannon Houchins, "a producer and executive who has been spreading the country-rap gospel since the late 1990s/"
Chris Arnade and Sarah McCammon were just commenting on Twitter about this op-ed/essay by Lawrence Summers in the Financial Times last fall. 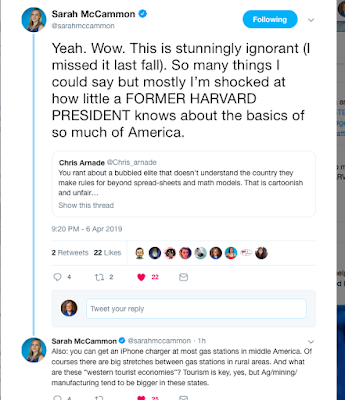 Summers is, of course, a former president of Harvard University (where he now merely a professor) and a former economics advisor to President Barack Obama. Here's a screen shot of the McCammon/Arnade Tweet. Like Arnade and McCammon, apparently, I missed this when it first ran, but it's well worth some attention for what it says about Summers' ignorance of rural America--before and, to some extent it seems, after--a road trip he and his wife took from Chicago to Portland last fall. He notes that they drove only on two-lane roads and that the "larger cities" they passed through included Dubuque, Iowa (population 57,637); Cody, Wyoming (population 9,520) and Bozeman, Montana (population 46,596, and a rather dramatic example of "rural gentrification," I might add). Some excerpts follow with a focus on two themes of the essay: emptiness and remoteness. (As for the abandoned cafes, gas stations and hotels, I must say I have noticed many such businesses for sale in recent years as I have driven through the more rural parts of far northern California/the would-be State of Jefferson). We were also struck by how remote the concerns of the coasts seemed. TVs in bars and restaurants were rarely turned to news channels. No one seemed terribly concerned with the controversy over Supreme Court nominee Brett Kavanaugh. We saw 15 roadside signs opposing abortion for every other political sign of any kind. The focus on the emptiness of the land and local concerns reminds me, at least in tone, of this from a Princeton University professor in fall, 2017, marveling that timber and timber production matter in the places with which she is unfamiliar/just learning about. And here's another post based on wide-eyed tourism into rural America, though the conclusions drawn here are more positive (if also a bit pollyanna). I suppose the Summers essay also just reflects an economist's way of seeing things: that which is not productive is not worthy or worthwhile, though an argument could be made that this very emptiness is part of what attracts some folks to remote places. It is also part of what attracts tourists to the West, another phenomenon that seems to surprise Summer as worthy of note. I'm thinking this essay was only published by the Financial Times because, well, it was written by Prof. Summers. 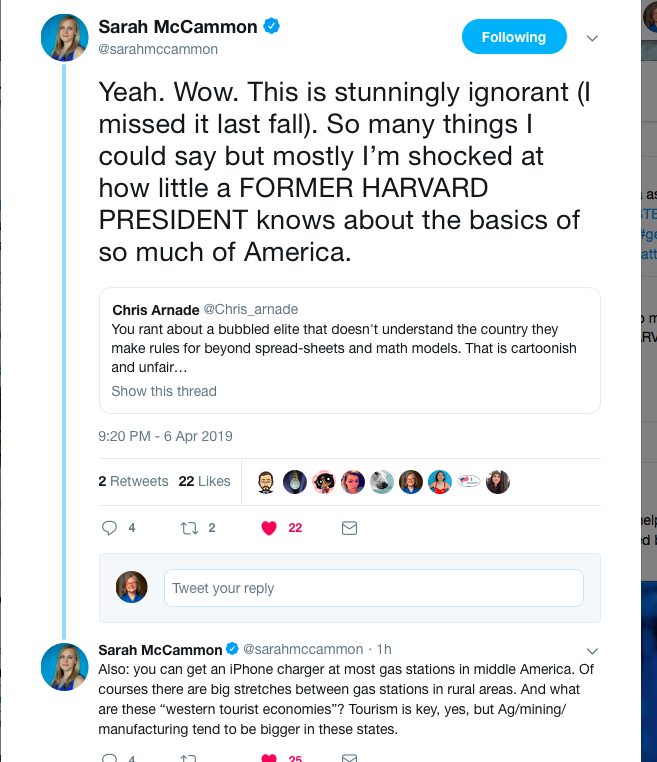 I'm also thinking about the ways in which this piece sheds light on what Harvard's leadership knows of rural America and therefore how it values (or not) rural students, a topic of this post from last fall. Democratic presidential candidates are making their way to California. A dozen of them have visited the state a combined 38 times, and there is no shortage of trips on the horizon. But in their efforts to woo voters from the most populous state in the country, Democrats have largely ignored the Central Valley — a region with 6.5 million people and five large cities. A Sacramento Bee analysis shows none of the 16 declared candidates have held a rally in the valley. Instead, they’ve flocked to wealthier, urban communities like Los Angeles and San Francisco. California Sen. Kamala Harris became the first viable candidate to visit the region when she held a fundraiser in Sacramento Monday night. While it’s early in the 2020 election cycle and candidates need to find places with plenty of big-dollar donors, lawmakers, political experts and local activists warn it would be a mistake to continue dismissing the Central Valley. Historically, when Democrats have come to the area, they’ve just treated us as an ATM. We hoped moving the Democratic primary up to March, that there’d be more attention to the Central Valley and to our needs. That hasn’t seemed to happen yet. ... With 20 Democrats running, we ought to get one of them. The only candidate with a Fresno visit scheduled is Julian Castro, who will speak to donors, but not hold a rally, on May 3. Charging for public defenders presents a major barrier in access to justice. Imagine being found indigent, unable to afford your own defense, getting an attorney appointed for you because of this fact, and then getting charged anyway. This reality, which seems inherently unfair, is the reality that many litigants face. New Hampshire Public Radio recently highlighted the story of a Keene, NH man who was billed $750 by the State of New Hampshire after using the services of a public defender in a case where he was found not guilty. This story is not unique. According to an NPR chart, the majority of states charge for criminal defense for indigent clients. In 2010, reports by the Brennan Center for Justice and the American Civil Liberties Union found that many states charge fees to indigent defendants, some of which can get as high as thousands of dollars. An interesting note from the Brennan Center report is that these fees have, in Michigan at least, increased the rate at which people decline representation. This is a substantial barrier to justice. Unlike civil legal aid, which is provided entirely free of charge, indigent defendants often face a situation where they would be liable for the cost of their counsel. Because of this, when faced with the possibility of paying out of pocket for an attorney, a criminal defendant might think that it's better to go for it on their own. After all, if a person is found not guilty, then they've incurred an expense because of a crime that they may not have even committed. The can often result in a cascading waterfall of negative consequences. Since the debtor is often the state, the consequences of not being able to pay can often be greater. As the linked USA Today article notes, people can even lose tax refunds when the state comes to collect the debt. For low-income litigants, this results in lost money that they could use for food, clothing, rent, utilities, and other essential items. When you're in poverty, you're often living on the financial margins, every little bit helps and every little bit that you lose can hurt severely. Are these programs even successful? In at least one state, no. The Argus Leader in South Dakota discussed the low collection rate for these fees from indigent defendants. The states are needlessly creating burdens on low-income people for money that they will likely never see again. Many low income people simply cannot afford to pay and by choosing to exercise a fundamental right that has been recognized by the United States Supreme Court, they may be imperiling their financial future. However, by denying counsel in order to avoid this outcome, they are also imperiling their freedom and their future. After all a criminal record can often preclude a person from employment. The result of this peculiar predicament is a no-win situation for those who find themselves unfortunate enough to be in it. The exercise of a fundamental right should not come with unnecessary risks. It's been striking to see three opinion-page pieces prominently mentioning rural issues in the past few days. I'm just going to briefly mention the three here, though I don't have much time for analysis. Appalachia has been going through rapid, often painful changes for the past hundred years, and our communities have been working hard to rebuild our economies. Over the past decade, many of us have put aside partisan politics to work together to do what’s best for the places we live in, the places we love. But the 2016 election has strained the bonds we’ve forged — and has led to deep reflection and conversation within the region. Gipe has an essay in the collection Appalchian Reckoning: A Region Responds to Hillbilly Elegy, to which I am also a contributor. I had the pleasure of hearing him read from that essay in Asheville, North Carolina, on Saturday night, at an event coinciding with the Appalachian Studies Association meeting. I was delighted by, among other things, his remembrances of the 1974 film, "Where the Lilies Bloom," and I promptly came home and ordered it, though it cost $75 on amazon.com. The Iowa caucus offers Democrats an opportunity to hone their pitch to rural America. Some of the biggest problems around here are in agriculture and trade — yet in those areas, several candidates seem clueless. One appears to know so little it would make a sixth grader in 4-H roll her eyes. Another was smart enough to speak to a small gathering of progressive farmers but not thoughtful enough to take questions or engage. Bernie Sanders came pretty close last week by going after multinationals’ near-monopolies. A strong Democratic platform with realistic plans for rural America would focus on four themes: demography, infrastructure, farm sustainability and environmental practices that can help combat climate change. I'm going to collect here various recent stories about the impact that media/newspaper consolidation is having on small towns and rural communities around the country. Here's a Washington Post story from January on the gutting of local newsrooms. The story focuses, however, on Gannett's reductions, with anecdotes from cities like Memphis, Nashville, and Knoxville. It doesn't really attend to smaller markets, though Gannett (a/k/a USA Today network) also owns papers in places like Redding, California (population 90,000) home of the Record Searchlight. That paper serves the northern third of the massive Golden State. In rural areas that already struggle with doctor shortages, the loss of rural news also cuts into readers’ knowledge of important health issues. “When you talk about outbreaks, it’s crucial local journalists get the information out,” said Amesh Adalja, a senior scholar at John Hopkins University Center for Health Security. new research suggests America’s increasing partisanship may be related to a monumental shift in the nation’s media landscape over the past three decades. As local newspapers shrink and close, people interested in the news are left more reliant on national outlets. As a result, they become more disconnected from their own communities and elected officials, less interested in voting — and more politically polarized. Without a revival of support for local journalism, experts say, that trend may be difficult to turn around. When local print news coverage drops, residents are less likely to participate in civic activities, like contacting public officials or joining a community association; less knowledgeable about the candidates for their U.S. House district; less able to hold municipal officials accountable, leading to economic inefficiencies; and, ultimately, less likely to vote. One finding was "nearly 2 percent more straight-ticket voting in such counties compared to similar ones that hadn’t lost newspapers." Straight ticket voting is a measure of political polarization. Here's a story on Sinclair media, a dominant broadcast force in smaller markets.